Here’s my interview with William (Bill) Boekestein about his book A Colorful Past: A Coloring Book of Church History. Grand Rapids: Reformation Heritage Books, 2018, paperback. 1. William (or let me just call you Bill), I really like your idea to teach church history to children through a coloring book. How did you come up with this idea? While raising four children—the youngest is presently four—a lot of coloring books have come into our home. And it has been hard to miss how engaging coloring books can be for little children (and older people too!). Children don’t skim coloring books. They invest themselves in them. They roll up their sleeves, wrinkle their faces, and get to work! And as they work, they practice endangered contemporary disciplines like sustained noticing and plodding concentration. To get a child focused on a single idea for ten minutes is nearly a miracle today. So, it made sense to me to offer a book that introduces children to some of the great heroes of the faith, that great cloud of witnesses (Heb. 12), while they participate in an activity that they love. 2. There are many Christian coloring books out there. What do you think is unique about your work? And what is the main thing you want your readers to take away from your book? This coloring book is unique in that it is patterned after a mosaic. Each page is a unique snapshot in time; a figure of church history skillfully frozen into an image by the illustrator. That image is important. It helps understand the struggle and success of a special child of God. And that snapshot represents only a brief phrase in the life of that figure. But that figure’s entire life represents only a single tile in the vast mosaic of God’s amazing church. So, I hope what makes this book special is how children and their parents can use it to soar like an eagle over the theological landscape of the past twenty centuries, seeing how God has built up Jerusalem (Ps. 147:2) with the living stones (1 Pet. 2:5) of highly flawed people. They can get the big picture of God’s work in history. But they can also swoop closer to the ground to ponder what made these forty-two historical figures unique, in the same way that they—the readers—are unique. To say it differently, I hope readers gain an appreciation of both the forest and the trees of church history by coloring this story. 3. Your book contains forty-two historical figures and only two of them are female (Monica and Lady Jane Grey). In light of this your readers might think that in the study of church history women are not as important as men. How would you respond to this? There would be no important men in the history of the church if not for the love, nurture, and support of countless important women! We could have featured more women who made invaluable contributions to church history (a great idea for a future project!). But your question could similarly be asked of God’s list of saints in Hebrews 11 where named men outnumber women almost ten to one. Each of the named men was shaped by vitally important named and unnamed women. Jesus himself was helped in his ministry by women, many of whom are not named (Luke 8:1–4). So, in using this book, readers might reflect on how God mightily used also the mothers, sisters, and daughters of those who are featured, just as he is served by the amazing women in today’s church. 4. Judging from the contents of the book, it looks like you have a special interest in the sixteenth century period. Am I right? Please elaborate your answer. There is no unimportant century in the history of God’s church. But something special happened in the sixteenth century. A reform movement, gathering force for centuries, shook the Roman Catholic Church and reintroduced a radical submission to Scripture and the life-saving doctrines of grace. The sixteenth century should be viewed, however, as the “golden-age” of the church. By God’s grace it is possible for Christians today to see even further than Luther, Zwingli, and Calvin (and others) because we stand on their shoulders. 5. What started you on the path to writing for children? And what has been one of your most rewarding experiences as a writer? My first books were full-color introductions to the Reformed Confessions written for children (Faithfulness under Fire: The Story of Guido de Bres, The Quest for Comfort: The Story of the Heidelberg Catechism, and The Glory of Grace: The Story of the Belgic Confession). I wrote these stories to help my own children and the children of my congregation better understand the story behind the theology they were learning in the preaching. Most of my books have grown out of, or were written in connection with, local church ministry. Not everyone will write books. But most people would experience such rewards as increased clarity and memory retention by committing their thoughts to writing. This has been my experience. I have also been gratified to receive notes from folks I’ve never met saying things like, “We are using your Bible Studies on Mark and have gained refreshing insights. Thank you!” Writing should serve a definite and defensible goal and be deemed worthy of the enormous commitment and sacrifices need to bring a book to print. 6. What were some of the challenges you encountered on the road to the publication of this book? One of the challenges was rightly handling the realities of persecution. It is awkward to see Ignatius about to be mauled by lions, Polycarp bound to a pile of wood that would consume him, and Justin Martyr kneeling before the executioner’s chopping block. We hope we’ve handled these troubling realities with appropriate restraint. But we also hope that children will see in the sacrifices of these saints that Jesus is worthy of our calling to offer our bodies as living sacrifices (Rom. 12:1). Another challenge was knowing how transparent to be about the faults of our “heroes.” We made the decision to alert readers of Charlemagne’s regrettable habits of forced conversions and womanizing. We could have talked about Luther’s anger or Zwingli’s sexual immorality early in his ministry. This is uncomfortable for us. We want our heroes to be pristine. But that isn’t reality. And sanitizing the lives of our forefathers (and mothers) isn’t good news for us. We need heroes who knew their sins and found salvation not through personally eliminating their faults but through faith in Jesus and his shed blood. 7. What book projects are you working on now? I hope my introduction to the end times, The Future of Everything: Essential Truths on the End Times (RHB; 2019) will help readers better understand the importance of eschatology for Christian comfort and practical living. My friend Steve Swets and I are also editing a collection of essays for elders and deacons called Faithful and Fruitful (Reformed Fellowship; 2019) which should be a great encouragement to church officers as they carry out their important calling. This book has its origin in the pulpit of our congregation, Dutton United Reformed Church. From May 2012 to November 2014 I delivered a series of fifty-five expository sermons on the book of James, and five of these sermons were all about the tongue. With the encouragement of Dan Van Dyke, general manager of The Outlook (the journal of Reformed Fellowship, Inc.), I decided to submit the edited version of these five sermons to be published in installments in The Outlook. Having received good feedback from the readers, I was inspired to put these articles together as a book. I therefore want to thank all the board members of Reformed Fellowship, Inc., for granting me permission to publish these articles in book format and for agreeing to publish the book itself. I also wish to express my special thanks to Josh Dear for editing my sermon notes to transform them from sermonic form into book form. I am also indebted to Linda Triemstra for polishing my manuscript and to Jeff Steenholdt for designing and typesetting this book. A big thanks also goes to my dear wife Sarah for helping me improve the manuscript and for her being understanding as I used part of our family time to work on this project. Finally, I am deeply grateful to God for giving me strength to complete this study. Click here, if you are interested in purchasing a copy of this book. Paul’s Spirituality in Galatians: A Critique of Contemporary Christian Spiritualities. Eugene, OR: Wipf & Stock, 2015, 208 pp., paperback. 1. What do you think is your book’s unique contribution to the study of spirituality? Also, can you please briefly define the term spirituality and explain how your definition differs from the other definitions that you critique in your book? One of the more unique contributions this book provides is a merging of formal theological study, resulting in practical theological corrections, all based primarily on Galatians 2:20. The real heart of the book rests in addressing the issue of the basis of Christian spirituality. As Christians, our spiritual life should be based on the firm foundation of God’s Word as our primary rule for faith and living. This point naturally leads into the question concerning what “spirituality” means. A brief history of the use of that term is provided in the book. “Spirituality” on the most basic level in today’s society should be understood as the life one lives in light of one’s understanding of and experience with god. Notice “god” and not “God” is referenced here. Everyone is spiritual on some level and the “god” that has influenced a person’s understanding and experience is that standard that drives the values of his/her life. Christian spirituality, however, is that process of spirituality brought under the influence of the Holy Spirit. So, when Christians refers to “spirituality,” they are meaning the life that is “spiritual” or influenced by the Holy Spirit in their lives. The problem today then becomes two-fold. First, that which has traditionally been categorized as Christian continues to be broadened to included non-Christian beliefs that directly contradict the fundamental tenant of faith in Christ alone. Second, it is becoming increasingly common to hear of non-biblical, extra-biblical, or just strange teachings and behavior being attributed to the “Spirit” in some vague context without any biblical justification. This book then seeks to reorient the spiritual life as necessarily being grounded upon the clear revelation the Spirit gave us in the Bible. In reference to the last part of your question, this book doesn’t necessarily critique other definitions of “spirituality” but challenges the foundation upon which the convictions of various Protestant traditions are based. The point pressed throughout the book is that for Christian spirituality, the Bible should serve as the supreme foundation for Christian living versus being set along side or even subject to one’s own experience, one’s religious traditions, and/or one’s cultural sense of morality. Key staple positions within various protestant traditions are taken and contextually examined in light of Galatians 2:20 to show how a proper understanding of that verse can help correct certain teachings within that particular movement. 2. You call your first two chapters (1) The Centrality of the Cross and (2) The Centrality of Christ. In the context of Pauline spirituality, is there really a difference between the word cross and the word Christ? Does not Paul sometimes use these two terms indistinguishably (see Gal. 6:14, “boast…in the cross” & 1 Cor. 1:31, “boast in the Lord”). Paul certainly does use them interchangeably at times, just as Paul does the idea of the cross and the gospel (1 Cor. 1:17-18, 23); however, the interchangeable use of the terms in some contexts does not mean that in other contexts distinctions do not exists especially as it relates to the believer’s justification and sanctification. Paul in Galatians 2:20 utilizes the necessity of the cross in reference to the believer’s justification, particularly in dying to the law. So the cross involves a death while the focus on Christ as a whole emphasizes the life that flows out of this death. The text explains that as a result of being crucified with Christ, “I no longer live, but Christ lives in me.” The phrase “Centrality of Christ” is used to emphasize the specific means by which Christ lives in the believer while “Centrality of the Cross” emphasizes the specific means by which the believer dies to the law and the nature of the flesh (Gal. 2:19; 5:24). 3. In your book you examine Paul’s spirituality by specially focusing on Galatians 2:20. Why did you choose this verse? Galatians 2:20 has always been a special verse in my life going back to high school, and I’ve spent considerable time meditating on the implications of the truths it conveys in my own life. So, it’s a very personal verse for me, but the nature of the verse also worked well for the approach of this book for several reasons. First, it comes at the end of an incredible section in Galatians where Paul condenses much of the overall argument for the entire book. Within that context, the verse provides an intensely concise statement regarding both the believer’s justification in Christ and the sanctified life to be lived. Second, Galatians 2:20 is important to the approach presented in the book because it frequently appears within various writings on Christian living without any clear explanation concerning the meaning of the verse itself. Within more critical works, it has long been used to promote the mysticism of Paul or, as more often than not, the verse finds itself tucked away within the huge theological discussions surrounding the context of Galatians 2:15-19 without being given specific consideration. 4. What do you think are some advantages and disadvantages of the kind of approach that you use in your book to study Paul’s spirituality? The greatest advantage to this approach is that it drives us to examine the biblical evidence and highlights our predisposition to rely on emotion, tradition, and culture to shape our religious ideologies, convictions, and lifestyles. The disadvantage to this approach is that it is critical. The book is designed to be a critique of modern theological expression. While I approached this task as graciously as I could acknowledging my own tendency to read Scripture in a manner that most naturally fits my theological tradition, it is still a critical approach. Such approaches are often not as well received in a culture that overemphasizes a false understanding of relativistic tolerance. 5. What projects are you currently working on? In addition to the normal projects involved in pastoring a church, I’m currently working on a book I plan to call “Square One” on the basics of the Christian faith. The book is specifically designed for people who are interested in Christianity or spiritually young believers; however, it will also be a great resource for reminding mature believers of the essence of the call to follow Christ. Our church plans on using this work as a means for discipling new believers. Lastly, I’m also working on a parental prayer guide to help parents in praying for their children. Note: This post also appears on christianity21st.com. To purchase the book, click here. 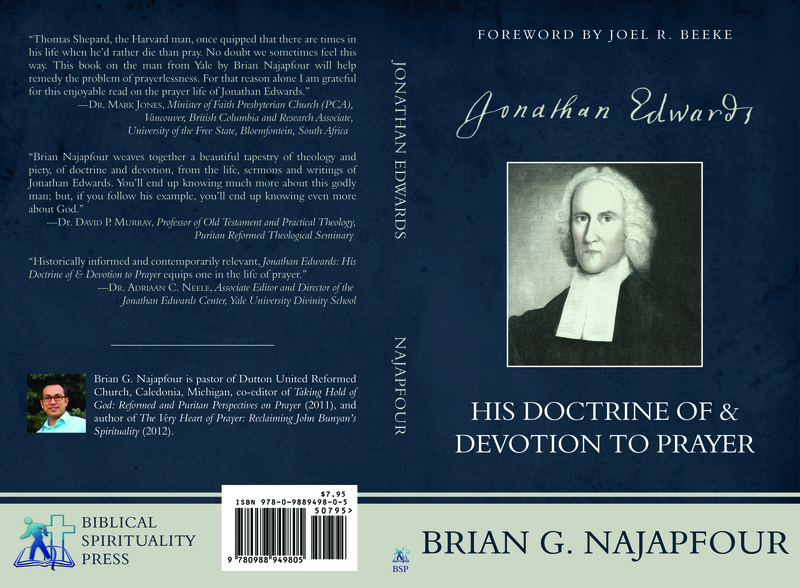 Jonathan Edwards: His Doctrine of & Devotion to Prayer has finally arrived. If interested, you can purchase a copy from Reformation Heritage Books. All the proceeds from the book will go to my mother-in-law’s medical expenses. Please pray for her as she is battling with stage four breast cancer. Thank you! “In giving Jonathan Edwards to the church, God did her an inestimable favor. In giving Jonathan Edwards to the reader, Brian Najapfour has done the Christian a great favor. 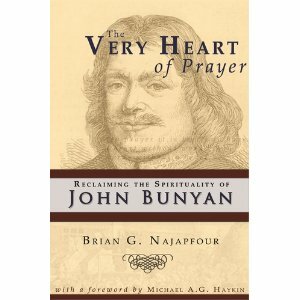 Brian G. Najapfour is pastor of Dutton United Reformed Church, Caledonia, Michigan, co-editor of Taking Hold of God: Reformed and Puritan Perspectives on Prayer (2011), and author of The Very Heart of Prayer: Reclaiming John Bunyan’s Spirituality (2012). —Dr. Joel R. Beeke, President of Puritan Reformed Theological Seminary, Grand Rapids, Michigan. —Dr. Nathan A. Finn, Assistant Professor of Church History and Baptist Studies, Southeastern Baptist Theological Seminary. —Rev. Maurice Roberts, Minister of Greyfriars Congregation, Inverness, Scotland, and former editor of Banner of Truth magazine. —Dr. Donald S. Whitney, Professor of Biblical Spirituality, Southern Baptist Theological Seminary, Louisville, Kentucky. Horton’s book is basically an exposition of Matthew 28:18-20. Under the theme of the Great Commission, Horton’s exposition consists of three main points: (1) message, (2) mission, and (3) methods. The Great Commission begins with a great announcement of Jesus that “All authority in heaven and on earth has been given to me” (v. 18). According to Horton, this glorious announcement is our motivation to do the Great Commission, because it assures us that Jesus has the power to save sinners. God sent His only begotten Son to the world to save whoever believes in Him. 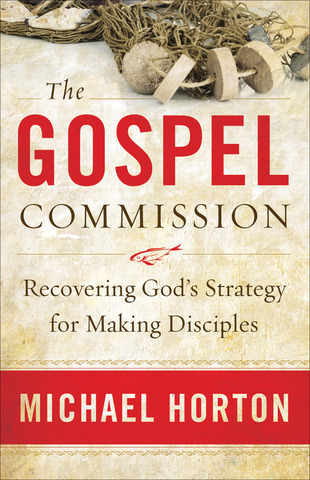 Horton emphasizes that the goal of the Great Commission is to make disciples. Christ mandates us not only to declare the gospel to the lost but to disciple new converts also. For this reason, we must show to these new believers their need to be part of a local church where they can grow in their faith along with other older believers. Preaching: We need to preach the law and the gospel. Horton says, “The law commands, telling us what we must do and threatening death for transgression; the gospel promises, telling us what God has done in Christ for our salvation” (166). The gospel is not just for unbelievers, but for believers as well. Baptism: Horton argues that baptism is “not only Christ’s mandate in the Great Commission but also means of grace that God uses to give us faith in Christ and to strengthen that faith to the very end” (173). Teaching: Horton notes, “When Jesus included in his commission ‘teaching them everything I have commanded you,’ he underscored the point I made…that a disciple is first of all a learner… (175). The Lord’s Supper: Hortonexplains, “Although it is not mentioned in the Great Commission, the Lord’s Supper is included on the command to teach everything that Jesus Christ has delivered to his apostles” (177). The Great Commission ends with a great assurance that Christ will be with us always through His Spirit. This assures us of the Great Commission’s success. The Commission begins with the power of Christ and ends with His presence.